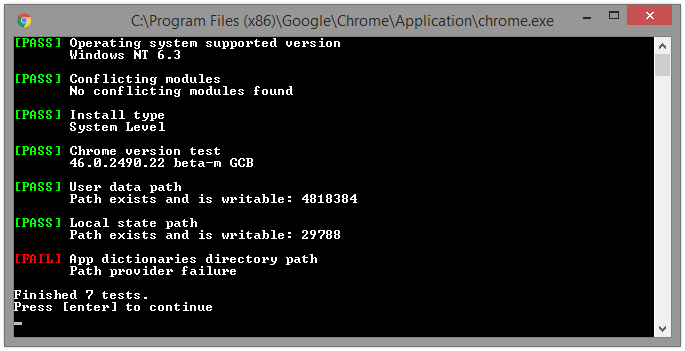 When I run Chrome with the --diagnostics flag enabled, it fails at the "App dictionaries directory path" test and aborts. I can't find any details about where this path is supposed to be so I can check its permissions and whether it exists or not. This test fails on a complete fresh install after reinstalling, and with a blank user profile. Browse other questions tagged windows google-chrome or ask your own question. Where is Google Chrome Crash Dump Located? How can I install additional dictionaries for Chrome? Where are app preferences stored in Chrome? Are there any dictionaries for Chrome that have more words out of the box? What's going on with this reparse point created by mklink?